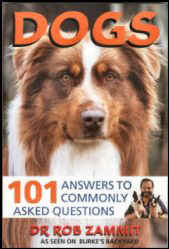 "DOGS - 101 Answers to commonly asked questions". We have had Australian Silky Terriers for 20 years, only one at a time and have always loved them. Pip came from Alice Harrison of Leeoaks Kennels . His dam was Muffin (Ch Nardoo Muffin) and sire was Blue (Ch Zenbusby Walkin Hot Shot). Pip came to us as a pet. We went to a couple of local shows to look at other silkies and decided to start showing, after a few shows we were hooked. Pip gained his championship at 18 months, then we retired him . 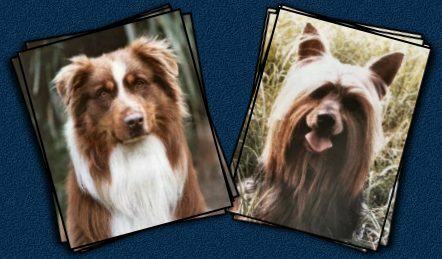 We missed the showing so much we decided to get another dog, at that time I met Linda Keogh with her two Aussies Paddy (Ch Sasin Bravo Battle Flag) and Lulu (Ch Beckabrock Bubaluba) we fell in love with Paddy and said to Linda we wanted a "Paddy". It wasn't long after that she mated them and along came Rex, born on New Years Eve 1997. He is only 1/2 way to his championship as we don't do many show due to work commitments. He has a good friend call Michelle Strain who does all his grooming and helps me show him. last year his coat was in bad condition due to sunburn but now with Michelle's patience in grooming him and keeping him under cover he is looking great. We are now hooked on Aussies and are planning another next year. We thank Linda for letting us have him. Please don't forget to Sign our Guestbook. We enjoy hearing from you. No part of this website may be reproduced or copied in any way without written consent from the webmaster..